Today in Masonic History William Dunlap passes away in 1839. William Dunlap was an American painter and pioneer of the American theatre. 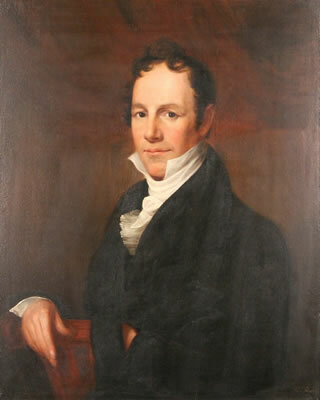 Dunlap was born on February 19th, 1766 in Perth Amboy, New Jersey. In 1783, at the age of 17 he produced a paiting of George Washington which is owned by the United States Senate. Later he would study in London under Benjamin West a British-American painter who painted a variety of historical scenes including the American Revolution and the Seven Years War. In 1787, Dunlap returned to America. On his return he began working exclusively in the American threatre. He produced more than sixty plays during his career. Many of them were adaptations of Frech or German works. By 1805, he was forced to take up painting again out of a need for money. By 1817 he was a full time painter. In 1834, Dunlap published his book History of the Rise and Progress of the Arts of Design in the United States. It is now considered an invaluable source of information about artists, collecting and artistic life in general in the colonial and fedeal periods. Dunlap passed away on September 28th, 1839. Dunlap was a member of Holland Lodge No. 8 in New York City, New York.